Carmie Matarazzo has passed each early-season test she’s faced with flying colors. The junior for the Neshannock High girls basketball team has moved from her previous spot at forward to guard, and the change has proven extremely effective both individually and for her team. Matarazzo is averaging a team-leading 14.3 points per game this season for the Lady Lancers (4-0 WPIAL Section 3-2A, 12-1 overall). She averaged 14 points and nine rebounds per outing in two Neshannock victories last week against Hickory and Brentwood. Her performance in those games earned her Lawrence County high school athlete of the week honors as sponsored by Washington Center Physical Therapy and voted upon by the New Castle News sports staff. Grybowski said that while Matarazzo is still adjusting to the position switch, she is getting there quickly. 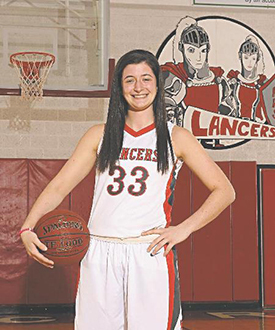 Matarazzo’s biggest contributions down the line could come on the defensive end, where her length and ability to switch into the post gives the Lady Lancers flexibility. But Matarazzo said that defense is probably her biggest weakness right now. Despite the early struggles defensively, Matarazzo has been one of Grybowski’s greatest weapons on the offensive end. Matarazzo has eclipsed the 20-point mark three times and has scored in double figures eight times in 11 games for the Lady Lancers thus far.